Brimming with fresh seafood, this dish yields an herb-infused broth ideal for soaking up with a thick slice of crusty bread. In a medium sized heavy bottom sauce pan heat olive oil, garlic, fennel, chili flakes slowly until garlic in lightly toasted. Add tomatoes and simmer 1 minute increasing the heat to high. Stir in basil, oregano, wine and clams and simmer 2 minutes covered. Season remaining seafood with salt and pepper. Add shrimp stock to pan and return to simmer. Add remaining seafood and simmer an additional 2 ½ to 3 minutes or until cooked through (be careful not to overcook!). 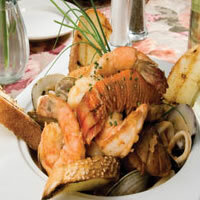 To serve: Divide seafood and broth into 4 medium sized pasta bowls and serve with 2 slices grilled bread.